Ok, let's be real...these 20oz Yeti Ramblers are awesome, but they shouldn't cost $45. We get it...you want to show off some cool Great Need swag, but you're a little surprised by the price tag. Well, that's because this is a fundraiser. With the "profit" from each one of these cups, we can do some pretty amazing things in our work serving orphans in Iraq. Each cup sold allows us to serve a kid with clothing (pants, shirt, socks, shoes), a medical checkup and preventive care, and food for several months. You can sip your always hot coffee or tea from your stylish Yeti and one of the awesome kids we serve in Iraq gets the help they desperately need. It's a win-win! These Yeti Ramblers are fresh from the Yeti Custom Shop where our logo is laser-etched into one side. 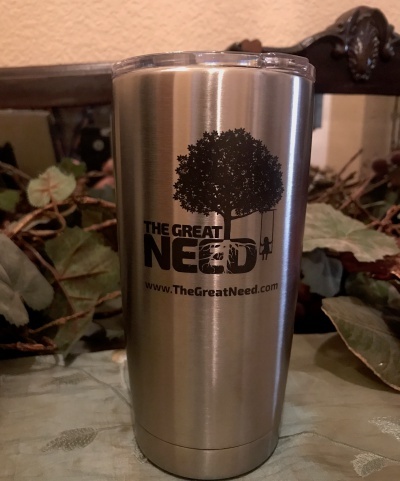 In addition to the Yeti tumbler(s), would you like to make a donation to The Great Need's Iraq Project.